Take Exit 32 (Dual Highway/Route 40) west towards Hagerstown. At the first light, the intersection of Dual Highway and Edgewood Rd, make a right. You will pass through 2 traffic lights, one will be for Mt. Aetna Rd and the other will be for the Meritus Medical Campus. After the second light, you will make a left turn onto John F Kennedy Drive into Rosewood Village. Drive 100 yards and you will find Hagerstown Sports Club & Fitness on the right. Take East Washington St towards Dual Highway (Route 40). Make a left onto Mt. Aetna Rd. At the traffic light for the intersection of Mt. Aetna Rd and Robinwood Dr make a left. You will pass through 2 traffic lights, one will be for Mt. Aetna Rd and the other will be for the Meritus Medical Campus. After the second light, you will make a left turn onto John F Kennedy Drive into Rosewood Village. 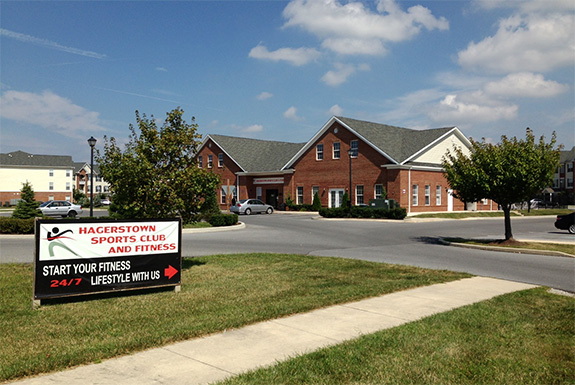 Drive 100 yards and you will find Hagerstown Sports Club & Fitness on the right.